“The management of used clothes in developed countries generates resources in countries like mine. 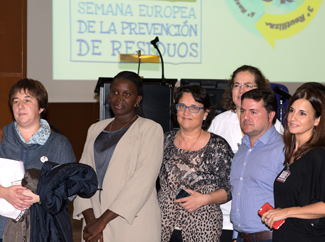 This means that many young people have the opportunity to carry out professional training and a future career,” explained Apili Vieira during her two day visit to Asturias as part of the European Week for Waste Reduction. 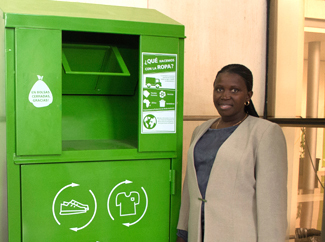 The benefits obtained through used clothes management enable Humana Fundación Pueblo para Pueblo to fund and develop environmental protection programmes in Spain and development initiatives in developing countries. Currently, 13 million people participate in 700 active development projects across five continents. One of these is the Bissora Vocational School in Guinea Bissau: it’s a professional training school which offers courses to young out of school people, to enable them to join the job market and even start their own small business ventures. They receive both practical and theoretical training in the following courses: agriculture, construction, business and administration, solar energy, electricity, and plumbing. These courses have been designed to meet the needs of the communities surrounding the college. Bissora Vocational School was inaugurated in 1994 and our local partner, ADPP, has been managing it since 1996. Each course is 11 months-long and since it opened, the school has trained over 1,200 young people. A significant portion of them are young women: the school works to mainstream gender issues and promote young women’s integration into the labour force, even in professionals that are traditionally for men. “About a quarter of the population is between 18 and 32 years-old. They make up the mainstay of Guinea Bissau’s productive sector. For this reason, training them makes a significant contribution to national economic development,” ADPP confirms. The add: “The school emphasizes entrepreneurship and trains young people to carry out their work well.” An internal survey reveals that 25% of graduates have been employed by companies and half of them go on to create their own small businesses as contractors or freelancers, sometimes even providing employment for others. During her visit to Europe, Apili shared her story in Lisbon and also Asturias. While she was here in Spain, accompanied by the Manager of the Humana Delegation in Asturias, Ricardo Rodríguez, she took advantage of the visit to meet and speak with the Director of the Asturian Agency for Cooperation, Gimena Llamedo; a group of managers from Masymas Supermarkets, and Patricia Hernandez, Manager of Los Prados Shopping Centre. 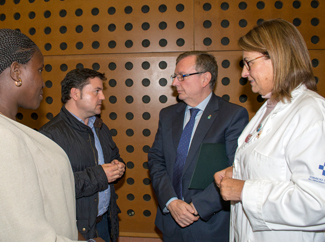 Furthermore, she participated in several activities organized by the Gerencia Área Sanitaria III at the San Augustin de Aviles Hospital, and a roundtable where she explained how clothes donations directly influence the improvement of quality of life in less fortunate communities.